Matthew Stewart: What? What is it? What's so funny? Grace Trevethyn: [laughing] You're Scottish! Take the high road to a comedy that truly lights up. 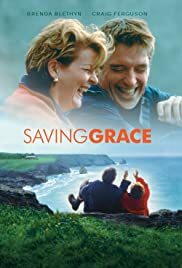 Saving Grace is a nice movie to watch in a boring afternoon,when you are looking for something different than the regular scripts and wants to have some fun. I mean,the whole idea of this movie and all the marijuana in it is such a craziness! It was the first movie I watched with this theme(drugs/marijuana) that is not really criticizing it,only making jokes about it. Grace Trevethyn is a widow,who lives in a small town in U.K. and has many financial problems because of her dead husband, who committed suicide since he was full of debts. The problem is that Grace, who imagined to have some money saved for her, discovers that she needs to pay all of her husband's pounds in debts to not lose all of her things, specially her house that she loves so much. She never worked before, and is in a tragic situation until Matthew,her gardener who is very found of smoking pot, decides to make a partnership with her in selling marijuana in large scale.